As I hung these small pieces on the line this morning, I was thinking about the many ways indigo can be used in the elementary classroom. It must appear daunting sometimes, especially when working with the younger set. I’ve been thinking about this as I pull my list together for Artspace. It’s due soon and, of course, don’t want to submit it last minute. I feel like I need to work through the activities and possibilities, though, and I’m finding that my list is shrinking. I’m realizing that the main “ingredient” to my week’s activities is indigo. It’s almost all I need. Basically, it will come down to using it in different contexts on paper and cloth, and there are so many. Indigo has also become much more approachable as a medium. An earlier concern was also filling the time – 5 days and a little less than 3 hours everyday. It’s a lot of time. I think, though, it will easily be filled and my young charges will have a lot to show for their efforts. It will be fun filled week. In the meantime, “sensei” will keep practicing and exploring. We’ve had some terrific thunderstorms lately. One ferocious one came around 1:30 a.m. that had me visualizing the storm in shibori. I haven’t worked out the process on that imagery yet. This is much more ordered – the calm after the storm – then again the last day of winter which doesn’t feel one bit like it (80s today). Anyway, this is a fairly large piece (44′ x 44″), from an old piece of cotton from a friend. I don’t know the history of it, but it was showing age. It seemed a good way to use it. It just worked out that way…it was an off and on gloomy and slightly chilly day, but warm enough to heat up the vat and hang things on the line. It was a good day to play around, see how strong the vat was and play with some upcoming spring imagery (for 2nd graders). I have other approaches in mind – maki-age perhaps, Chinese butterflies (? )…I’m not entirely sure. Beginning simply, with shapes is a good thing, but this could be too easy or folding differently and using the same shapes…it has potential…we’ll see. I’ve worked with the age group many times, but the activity is new (I usually do high school) and I really want to do it. I especially want to introduce them to indigo and think it will work well in this context due to its immediacy. I’ll be limited to roughly 45 min. per class as usual, so we’ll be working quickly – hence the play. I’ve got a couple of months before that time, but playtime/prep well in advance is always a good thing. In this case though, the indigo was calling. The only warmth in the outdoor studio today came from the Indigo. Otherwise, it was too cold for this activity. I think I was restless, since we are anticipating a snowstorm this evening. It was a good way to spend part of the afternoon, at any rate. I only managed a few pieces, but it helped to begin working through some ideas for an upcoming workshop in a Cary high school. My horoscope this morning indicated that summer isn’t over yet, not by a long shot. I didn’t need to “consult” that aspect of the paper to figure that out. We’d planned this day some time ago, so I hoped for good weather and it did work in our favor. The cicadas were not so strong, but their lament still hung in the air. 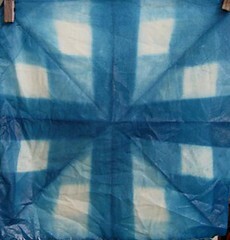 We focused as usual on the indigo and what kinds of patterns we could create on the silk by dyeing and then over dyeing, sometimes several times over. I was amazed to see the subtleties and the depth of hue. We took a light lunch break: salad and bread with a fruity drink topped with a sprig of mint. Then we went back to work. The day passed quickly but I think the results were quite satisfying. Taking a day like this reinforces (for me) the necessity of not getting too deeply entrenched in my usual production efforts (ie. prepping for schools). I’m finding that a few hours with friends keeps things fresh and engaging. I also gain inspiration and innovative approaches to my daily activity. It was a day too humid to breathe. The moisture hung in the air, but we hung out by the indigo dye vat anyway. The cicadas were making their droning sounds in the trees, typical for late August. Later a little rain moved in. The detail on this piece of cotton is Itajime, board clamping. While the patterning may not reflect authentic Sekka patterning, I used the same technique. The indigo and white remind me of yukata (summer kimono) that are so cooling to wear in the summer heat. 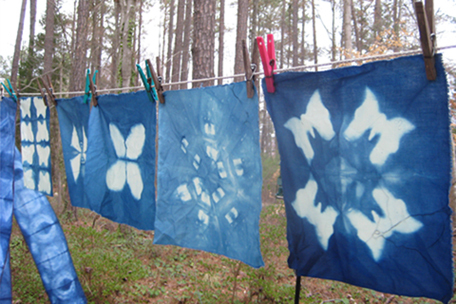 Tomorrow will be another day with indigo, but this time I will take it to Artspace and demonstrate a few aspects of dyeing with it at the family fun fest. たのしいなあ！How much fun!